The issue of corporate social responsibility (CSR) has been of growing concern among business communities in recent years. Various corporate leaders maintain that business is considered to contribute fully to the society if it is efficient, profitable and socially responsible. Islam is considered as ad-din (a way of life), thus, providing comprehensive guidelines in every aspect of the believers’ life. It is the aim of this paper to propose an Islamic model of corporate social responsibility based on human relationships with God (hablun min’Allah); with other fellow human beings (hablun min’an-nas) and with the environment. The main objective of CSR in Islam is to promote social justice as well as for the attainment of well-being. MUHAMAD, Rusnah; ABD. SUKOR, Mohd Edil; MUWAZIR@MUKHAZIR, Mohd Rizal. 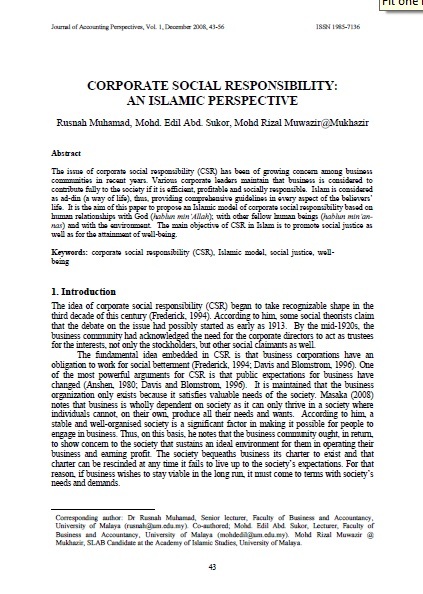 Corporate Social Responsibility: An Islamic Perspective. Asian Journal of Accounting Perspectives, [S.l. ], v. 1, n. 1, p. 43-56, dec. 2008. ISSN 0128-0384. Available at: <https://ajap.um.edu.my/article/view/3608>. Date accessed: 23 apr. 2019.